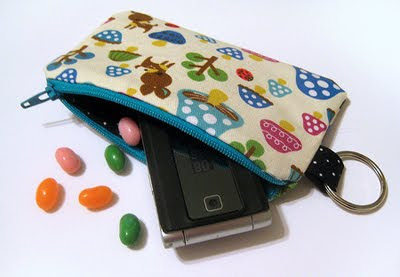 Or maybe you want a little zippered pouch with a key ring. Tutorial here. Maybe you want that zippered wallet to have some adorable detailing. Tutorial here. 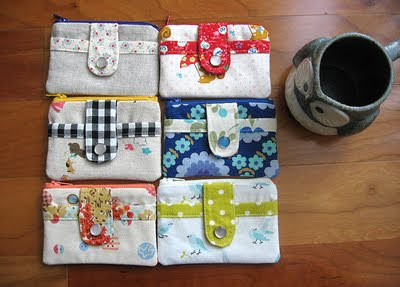 Or maybe you want to sew a bike basket, a diaper keeper, a mail organizer, or a host of other useful things listed on Anna's blog. Go crazy. 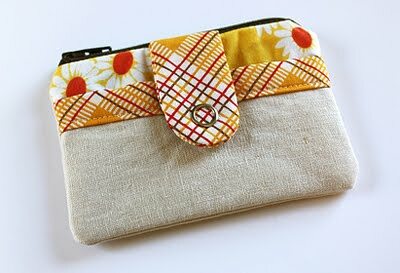 To see the lovely things others have made from her tutorials, like Yellow Poplar's pouches above, visit the Noodlehead Tutorials Flickr pool. 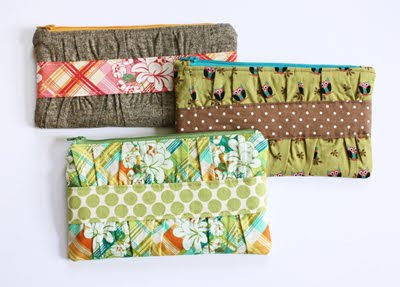 super fun fabrics and great little pouches. Thanks for sharing! Anna's blog and projects are awesome! These are really really cool. I have tons of odds and ends fabric that were leftover from when my mom made me a gorgeous black and white quilt. I've been trying to decide what I should do with them and I'm thinking this is a great idea to use up some of it. Thanks so much for sharing! These are great, if only I could put a zipper in. That's great! Thanks for sharing. I will definitely check it out! I've been to Anna's blog. Yes, tons of cute stuff available there! I do have plans for making some! So cute!! I wish I could sew! this is so weird, I just stumbled on noodleheads this morning, then I saw this. You are right, craft riches to be plundered there for sure. Maybe I should print them out as gift ideas for me to my friends who sew. haha! Love these tutorials! My fave is the first ruffle clutch...thanks for sharing! awww, these are the cutest pouches:) love 'em! Thanks for the link! Love them! Very excited about the mail sorter. I've been looking to make something just like that recently. Thanks for sharing. By the way: do you watch the soccer worldcup? And for which team to you cheer? The Netherlands? What neat links! Thanks for posting Noodleheads. Now I have MORE projects to try out! Dien, I'm afraid I'm not much of a sports fan. But if I cheered based on colors alone, I'd support the Netherlands every time! I love this blog and all her patterns. :) So adorable. I can't get enough of hand sewn items that look so modern and chic and are totally easy to incorporate into everyday life! Also, it does a great job explaining how to do the zipper! Wow! Those are super cute! I'm off to check out the rest. Thanks for sharing! Too much cuteness! I'm so excited! They're great, I would like to do them! I am attempting one right now! Cool! I hope it turns out wonderfully! I struggle working inserting zippers. However, watching your tutorial I believe that I can accomplish it properly and with confidence. Thank you! I love this website so much! Thank you for posting!!! !